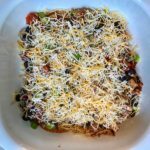 What could be better than layers of taco meat, tortillas, beans, and cheeeeese – because let’s face it, this casserole is all about the cheese? 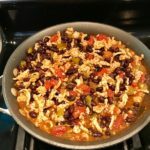 A Taco Casserole that’s made with healthier lean ground chicken, can be made ahead for your busy schedule, and can feed the entire family with leftovers for another night. Now THAT’s what I’m talkin’ about! 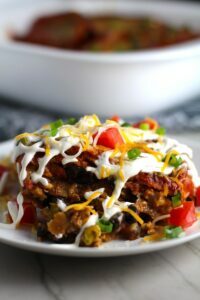 This Taco Casserole has corn tortillas layered with browned ground chicken seasoned with smokey mexican spices, black beans, tomatoes, and cheeeeese, and then more cheeeeese. Then topped with cheeeeese. Did I mention there was cheeeeese? 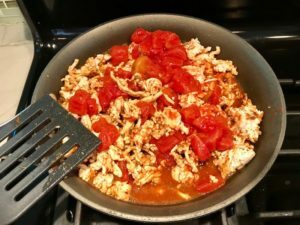 When Dave and I were first married, I started making my enchilada casserole with shredded chicken breast and cheese. 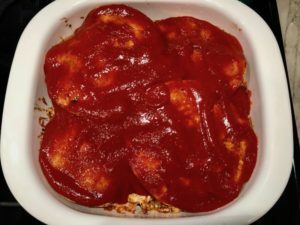 I have made this casserole for years. But when I had kids, I started adding pasta to it to bulk it up and appease their love for pasta. 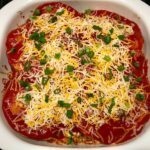 Then, when I started the Talking Meals Blog, I wanted to make my casserole more interesting, so I added chorizo because, well, everything is better with chorizo, am I right? 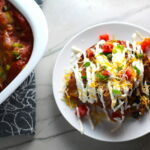 Check out my Chicken & Chorizo Enchilada Casserole and my most recently created, White Enchilada Casserole with Chicken & Veggies. 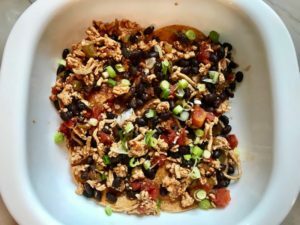 Clearly I have a Mexican Casserole addiction so this new Ground meat Taco Casserole is just the next progression and I am owning it! 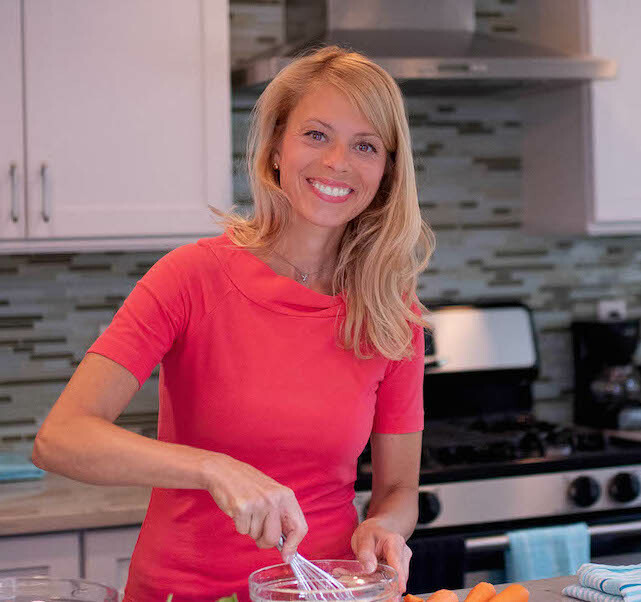 Ready for the bonus for this recipe? This entire casserole can be made ahead on Sunday and then cooked in the oven for 30 minutes on Monday or Tuesday. Then you can reheat the leftovers again on Wednesday or Thursday – so great, right? 1. 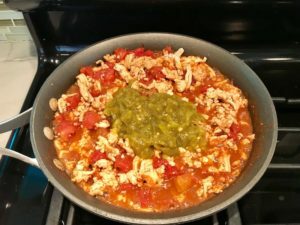 Make the Meat, Tomato, Bean filling – this is simply browning the meat with spices and seasoning, and then adding in the tomatoes, green chilis, and beans. 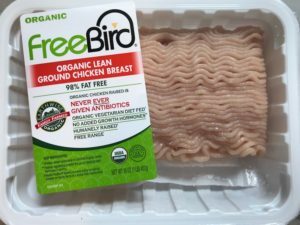 I love to use Free Bird Organic 98% Fat Free Ground Chicken Breast, Raised without Antibiotics. 3. Now, assemble the casserole! 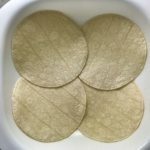 There will be 3 layers of tortillas, so make sure that you have about 3-4 tortillas per layer. To start, cover the bottom of the casserole dish with 4 corn tortillas. 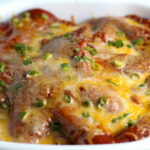 Then layer on half of the meat and bean mixture, sprinkle 1/4 of the scallions, then the add 1/3 of the shredded cheese. Do this again for the second layer. 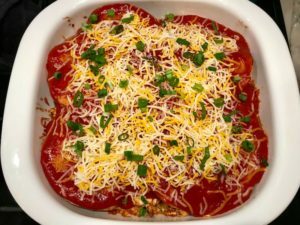 Then top with a third and final layer of tortillas, the tomato sauce, and the remaining cheese. At this point, you can either store the taco casserole in the fridge covered or cook it. 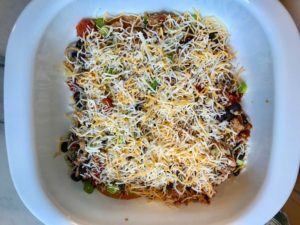 What could be better than layers of taco meat, tortillas, beans, and cheeeeese - because let's face it, this casserole is all about the cheese? 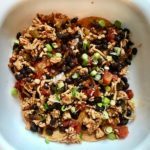 A Taco Casserole that's made with healthier lean ground chicken and can be made ahead for your busy schedule. 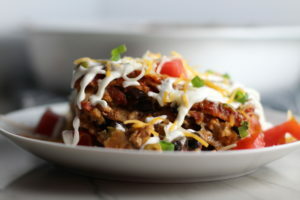 This Taco Casserole has corn tortillas layered with browned ground chicken seasoned with smokey mexican spices, black beans, tomatoes, and cheese, and then more cheese. 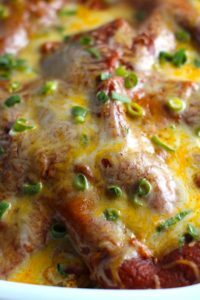 This entire casserole can be made on Sunday and then cooked in the oven for 30 minutes on Monday or Tuesday. Then reheat again on Wednesday or Thursday - so great, right?? Start by slicing the scallion and put aside until assembling the casserole. Drain and rinse the black beans. Open the green chilis and tomatoes cans so they are ready to be added. 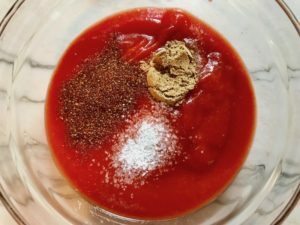 Make the tomato sauce by mixing in the chili powder, cumin and salt. Set aside until assembling the casserole. 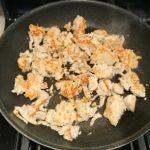 Add the ground chicken to a preheated large skillet with a teaspoon of olive oil that has been spread to coat the pan. 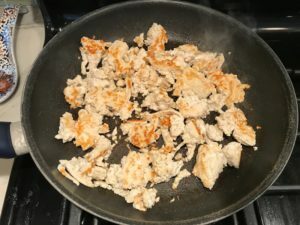 Add the salt and spices, then break up the chicken to spread around the pan, but then let it sit to really sear and brown, about 4-5 minutes. Once the bottom has really browned, break up the meat again and mix it up to brown all sides of the meat. Cook until all pink is gone from the meat, about 3-4 minutes more. 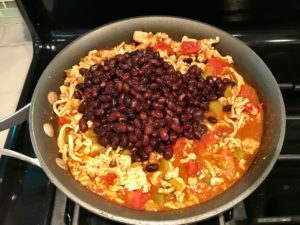 Add the canned tomatoes, the green chilis, and the beans. 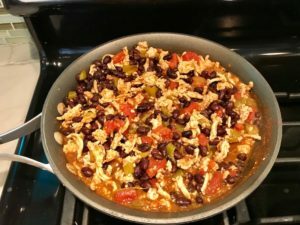 Mix to combine and cook together for another 5 minutes. Preheat the oven to 350 F degrees. You will need a 9x9 or 10x10 casserole dish. There will be 3 layers of tortillas, so make sure that you have about 4 tortillas per layer. To start the first layer, cover the bottom of the casserole dish with 4 tortillas. Next add 1/2 of the meat mixture on top of the tortillas. Sprinkle with 1/4 of the Scallions. Then top with 1/3 of the shredded cheese. Repeat! 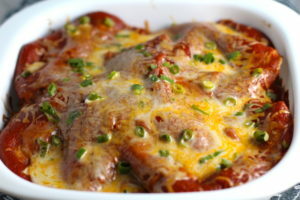 Cover with tortillas, then meat mixture, scallions, and cheese. Then the final layer of tortillas and then cover with tomato sauce and the remaining cheese and 1/4 of the scallions. The remaining scallions are for garnish. Bake 350 F degrees covered for 30 minutes until hot all the way through. While the casserole is cooking, dice the tomato. 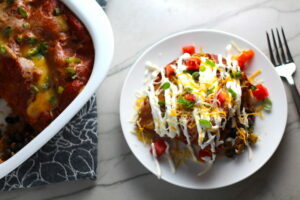 Plate, drizzle with sour cream, sprinkle with diced tomatoes, and garnish with scallions.